Here’s the thing, new and naïve authors who want to get into publishing: Rip-0ff artists like some vanity publishers will do ANYTHING to get you to believe it’s normal to pay huge sums of money to get published. 1. They’ll bad-mouth “big” publishers, claiming those jerks only want commercial, low-quality writing. Good thing they, the good guy, are here to give you a real chance. Down with the man! 2. They’ll claim your “deposit” of thousands of dollars will be given back to you “when” you’ve sold X number of books. And then they’ll proceed to advertise your book to you and nobody else (despite claiming they’re “marketing” for you). When they sell your own book to you, those copies don’t count toward the grand total. 3. They’ll praise you highly if you send a submission and make you think the contract they’re offering is something you’ve earned rather than something you’ll have to buy. 4. They’ll play up how low the chances are of getting published the “traditional” way and make you think there’s no way to get published without “knowing someone.” They may make outright false statements about how “all” new authors have to get their start by paying for a contract. 5. They’ll have tons of testimonials from their clueless authors going on about how excited they are to be published with a Real Book with their Real Words. But here’s the thing. You do NOT have to pay to be published. 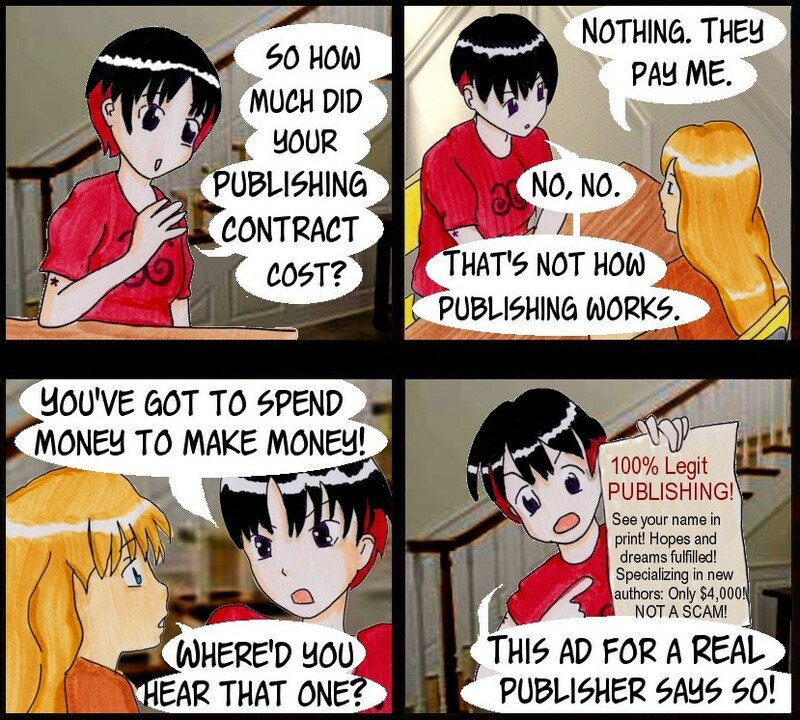 In fact, the publishers who do charge to be published are out to make money OFF OF YOU, not off of the consumer buying the product. Mainstream publishing invests in your work, uses their extensive network and know-how to market you effectively, and makes their money from selling the book to people who want to read it. They do not repeatedly advertise your own book to you. They do not have a submissions page that reads like an advertisement. Certain shady vanity publishers are very good at making naïve authors think they don’t have a chance to get published any other way while praising their skills and talents, and their whole business model is built on trusting you to NOT do your homework. The authors whose books you see in the bookstore did not pay a company to get there. They were chosen by publishers who paid THEM. Know what your work is worth and don’t let the professional scammers trick you into thinking paying for publishing is normal and necessary.